A very powerful online bible study tool with several translations including Greek and Hebrew. The depth of information particularly around the meanings of words is superb. 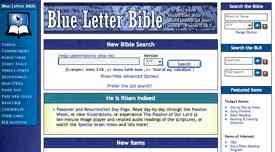 If you want a comprehensive online bible then Blue Letter Bible is a good choice. Where Bible Gateway opts for simplicity, Blue Letter bible opts for a multitude of options. With over 165,000 pages of concordances, lexicons, dictionaries, commentaries, images, and various bible translations there is certainly enough content here to throw light on any bible scripture. The lexicon and dictionary capabilities stand out as exceptionally useful and detailed. Indeed, whilst there is a large volume of content virtually none of it is surplus to requirements which means using Blue Letter Bible is simple and enjoyable. Blue Letter Bible trumps most online bible by offering both Hebrew and Greek texts. This helps to make Blue Letter Bible extremely useful for deep bible study when the English translation may loose the essence of the meaning. Getting started with the Blue Letter Bible is very easy, the image to the right shows the home page. Simply type in the book, or verse you want to read, select your preferred translation and then search! The home page also has links to other shortcuts most of which are mentioned in this review. You first realize the depth of content once the results of your search are given in the format you can see on the left. On the left of each verse are six letters in boxes which allow you to access the detailed information within Blue Letter Bible. This provides a list of any correlating verses in the bible and links them either by word or phrase. As well as providing the links to the passages, it provides all of the verses below the summary. This is a very useful feature that can be invaluable in quickly cross referencing verses. This is another powerful part of Blue Letter Bible and for every verse it shows the interlinear Hebrew or Greek (including the Septuagint), as well a list of all words with Strong’s Concordance notes. If you click on a word it takes you to the fantastic Lexicon. This shows the root of the word (Greek or Hebrew), a summary of the meaning, a summary of Thayer’s Lexicon, a link to Vines Expository Dictionary of New Testament Words, a list of all occurrences in the bible (with verses shown), and more besides. Assuming there is more than one commentary for a given verse you are presented with a drop down box to select the commentary you would like to read or listen to. The list of options is once again impressive. Several thousand audio messages are available from a variety of preachers/teachers. There is a good selection of Study Tools including the Condensed Biblical Cyclopedia. Finally there are also written concordances with contributors including Charles Spurgeon, Matthew Henry and Chuck Smith. The Spurgeon links alone would make a website worth visiting. Over 2,700 Hymns are included, indexed to the appropriate Bible verses. Not only does it include the words, but you can listen to a midi file (just of the music) or access the musical score. Here you can access various maps and images. Whilst you can choose which translation you view earlier in the searching process, this option shows any given verse in all of the available translations. A very useful feature yet again which will enhance any bible studies. The Blue Letter Bible has MP3 versions of three translations (NKJV, NLT & KJV) by Stephen Johnston. Available are the New King James Version (dramatized), the New Living Translation (dramatized) and the King James Version (narrated). There is an audio link on each of the Bible pages for these translations. It is worth noting these are copyrighted and you can only stream them through your computer and not download them. This tool in the sidebar allows you to type in any English word and it will return all occurrences of it in the bible (along with the Greek/Hebrew word it was translated from). You can then click through tho the great Lexicon section for words as discussed earlier. If you have your own website you can also add the free search tools to any page. You can choose from a word/phrase search, a verse search or a Strongs number search and the widgets they produce are very customizable. As well as the main content there are some other interesting sections such as the ‘sayings not found in scripture’. This highlights those sayings that people think are in the bible but aren’t. It then goes a step further and uses bible verses to show if the essence of the statement is actually biblical and true – or if it is just completely rubbish! There is also access to some daily devotions and bible reading plans. The layout and design of the website is on the whole very good. It takes a little while to get your bearings but this is understandable when you consider the sheer number of features and resources available. Despite the large amount of information that can sometimes be displayed the screen never feels cluttered due to the relatively clean layout. The Lexicon results are a great example of the well thought out design. 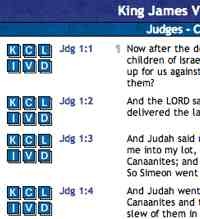 It can take a little while to get to grips with all of the options available, but once you do Blue Letter Bible shows it is a seriously impressive website. More customisation would be great. For instance, being able to choose a favourite translation that is remembered when you return. I am please that God is your comfort through your struggles. Just wanted to let you know that you can now customize your translation on Blue Letter Bible so that when you return it will remember your preferred translation. Thanks for your update on the Blue Letter Bible, that is a useful function. Is there a free edition of the blue letter bible for a PC. Any help would be greatly appreciated. 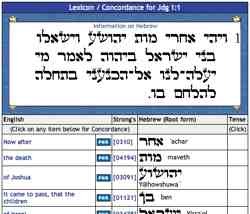 http://www.HolyBibleSearch.net & BibleStudyTools.com also let you search/study/read the Bible online in 150 languages/translations. web-site too for more facts and very helpful ideas . Hey, awesome site however there is a problem whereby sometimes I get sent back to the base page when I view other topics within this blog. Nowadays, you need to have an ultra modern web content management system to manage your website on your own. Select the Dashboard, click Tools, and then Export. You don’t have as much control over your blog as you would have with a self-hosted wordpress blog.